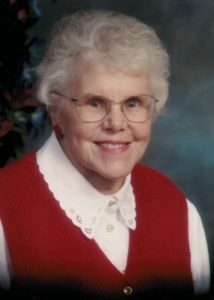 Alene S. Hunt, widow of Covenant pastor R. Stanley Hunt, died March 25. She was ninety-four. Alene was born November 13, 1924, in DeKalb, Illinois, to Emil and Signe Winstedt, and grew up in Cadillac, Michigan, Chicago, and Topeka, Kansas, where her father served Covenant churches as pastor. She attended North Park College and Washburn University. On July 14, 1946, Alene married Stan, and together they served Covenant churches in Donaldson, Indiana; Thomaston, Connecticut; Superior, Wisconsin; Trimont, Minnesota; Riverside, Rhode Island; Muskegon, Michigan; Cottage Grove, Minnesota; and Minneapolis, Minnesota (Brookdale). She served as chair of the Lake Superior District of Covenant Women, and as vice-chair of East Coast Conference Covenant Women. A pianist who could play by ear, Alene provided accompaniment to countless musical groups. Alene was a resident of Covenant Village of Golden Valley, Minnesota. She was preceded in death by her husband, Stan in 1984, and by her brother Clarence Winstedt. She is survived by two children, John Hunt and Sharon Mulé; three grandchildren and two great-grandchildren. A memorial service was held March 30 at Roseville Covenant Church. Interment was at Wayside Cemetery in Barron, Wisconsin.